This week: an individual skill drill for defenseman to help them work on their ability to clear pucks from the defensive zone. Split your defensemen up into two groups, with one group on each dot. A player from the opposite group stands at the blue line, playing an offensive defenseman. The first defenseman takes three c-cuts backwards, then open pivots towards the boards to retrieve a puck dumped in. The D is then trying to clear the puck from the defensive zone without it being kept in by his opponent at the blue line or going for icing. A team gets a point for every successful clear (w/o icing) – give the teams equal reps and keep score. The objective is to utilize what we call “vertical hockey” to get the puck into the neutral zone – lifting it directly into the NZ or going high off the glass. Some may say this coaches the skill out of hockey. I believe that this is a skill into itself – knowing when you are on an extended shift and under pressure, having the ability to lift a puck out of your zone without it going for icing. No diagram for this weeks drill, just an explanation. This is a great way to bring in quality skill reptitions into your practices. Can be done with any age, we do this with our players at Colby and I did it this morning with squirts. Emphasis is on quality of rep, not speed. Players have to focus on the technique of the skill they are working on. How it’s set up: simply divide the ice into four lanes using cones. Put three lines of cones up the ice (the long way), two in line with the dots and one in line with the center of the ice. These cones can run from the tops of the circles in one end to the tops of the circles in the other. This creates four lanes up the ice. Now start all of the players in one corner and have them go one direction in each lane (up lane one, down lane two, up lane three, down lane four and back in line). Each lane will incorporate a different skill set. They can work on any skill that you might want to practice. C cuts, ski edges, open hips, knee touches, 360 spins, stickhandling/dribbling, indirect self passes, weight transfers, etc, etc, etc. Think of any skill you’d work on and figure out a way to incorporate it into a lane setting. THen start the players from one corner. At peak capacity, there should be between 12-16 players going at once, with coaches spread out to monitor and encourage the skill reps.
Great work for players of all ages and a great way to incorporate skill and agility work without sacrificing repetitions and activity on the ice. A half ice skill drill for forwards and defensemen. The drill starts with forwards in each corner with pucks (Black lines). D are at the strong side point and the center point. X1 makes a pass to the strong side D, the center D widens and the puck moves D to D. X1 then rolls up the wall and times his approach through the slot so when D2 shoots the puck, he is in the slot area for a moving tip. D2 is shooting for a stick. X1 then goes into the far corner and retrieves a second puck (green lines). D2 is now at the strong point, D1 is at the center point. Puck moves down low, D1 widens and puck moves D to D. X1 rolls through the slot for a second tip. X1 then stays at the net front while a puck goes from X2 to D1 to D2 at center point (pink lines). D2 then takes a shot from dead on with a tip/screen in front. Forwards are working on their tipping/redirection skills as well as their skating and edgework in this drill. D are working on passing the puck, widening in the offensive zone and shooting for sticks. 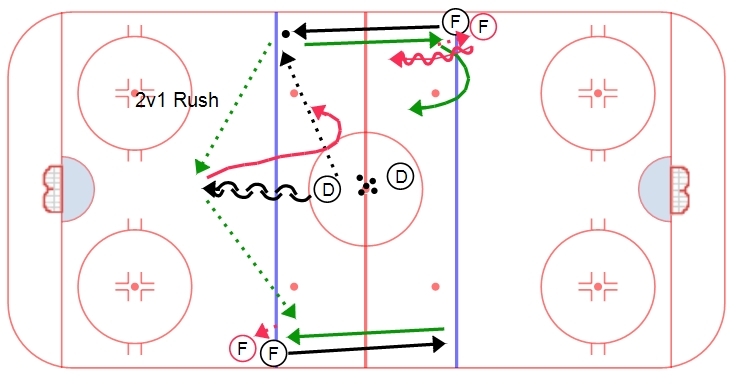 A drill that involves a regroup into a 2v1 rush. Defensemen start in the middle of the ice with Forwards at opposite blue lines. The first defenseman exchanges a puck with the first forward in line (black line) while skating backwards. At the top of the circles, the D receives the puck and transitions it to the forward on the opposite side of the ice (green line) who is coming back towards his line. When the F receives the pass from the D, he bumps it to the next forward in line (pink line/pink F). The F coming back towards his line swings to the middle while the F who receives the pass steps out. These two F’s then go and attack the D that was exchanged with initially in a 2v1 rush. The D is attempting to gap up after completing the transition pass to the opposite F.
A quick hitter 2v1 with multiple passes and a gapping element from the defenseman. This drill was a special contribution this week from Steve Needham, Assistant Coach at Wesleyan University. One of my peers in the coaching world, Jamie Rice (Head Coach, Babson College, @Ricer18), asked on Twitter about hard passes – are they more technique or mindset? It got me thinking about passing in general and the many elements involved. Passing is both a technical element of the game as well as a skill. It is one of the first things you learn when you start to play hockey and something that you practice for the rest of your career. Technically speaking, the pieces you need to master to give a good pass include hand placement, grip, spin, loft, speed, touch, and timing. To receive a pass, hand placement, grip, touch, and timing are all critical. Of all these areas, spin and speed are the most challenging to master when giving a pass, while grip and touch are the hardest when receiving. While these technical areas are important and critical to master, it is my belief that passing is more of a mental skill and habit than a physical one. Because passing is learned at an early stage, it is something that most players take for granted. The assumption is made that passing skills are sufficient and the work done in practice is enough to maintain passing skills. When executing passes, whether in practices or in games, very few players truly focus on the elements of the pass – they merely see their teammate and their muscle memory takes over (similar on the receiving end). The result is often missed passes and poor execution. How many times in practices do coaches have to make comments or stop practice due to poor passing? It is often not because the players lack the fundamental skills – it is because they take those skills for granted and choose not to focus on the execution. When players shoot, they look for a shooting lane, find their target and attempt to put the best speed on the puck to get the desired result. When passing, I believe this processing piece is far less common. With increased focus comes increased execution. Now, to answer Coach Rice’s question more directly regarding hard passes. Passing the puck hard is a habit. Habits boil down to the mental skill to execute a physical action. These habits are built through repetition and practice. As you move up in levels within in the game, time and space becomes less and less readily available. The game becomes more of a cause and effect between two units of five players rather than a pure talent contest. Passing the puck hard (with lots of zip and speed) becomes more of a tactical element at the highest levels. The puck moves faster than your feet, so you can create separation and a change of direction in the defense with hard passes. Whether in the neutral zone on a hinge or a cross ice seam or in the offensive zone on a play to change the point of attack (north/south or east/west) hard passes force the defense to have to react quickly to a new threat. Technically speaking, hard passes require a firmer grip from both the passer and receiver. Mentally, they require anticipation and a high level of focus to execute, as a hard pass is more difficult to both give and receive. Once again, the execution of a hard pass is more mental than technical, as it is a conscious focus and effort from one team to move the puck quickly. Passing the puck with good pace is the sign of a focused and determined team that has a good hockey IQ. They understand the value of a hard pass and they are prepared and ready to give and receive passes with zip on the puck. How do you make your team execute passes like this? Attention to detail in practice. Demand hard and firm passes in practice – it will establish the habit and carry over in to games.